The last cocktail we made when Heather and Bill came over with the bottle of Aviation gin was one we made up by experimentation. We had to taste and try several variations until we came up with the one we really liked. Sigh, the things I do for you, my readers. It was my friend, Bill, who came up with the basic recipe. 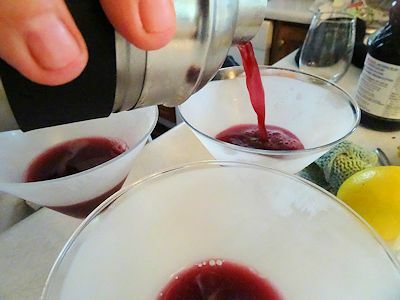 It is a martini type drink made with blueberry juice. We just adjusted proportions until we got it the way we all liked it. 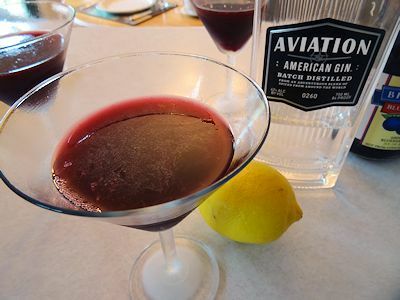 As it was made with Aviation gin, we went with an aviation theme for the name. Add to that the fact it is made with blueberry juice and it just had to be called an Aviation Wild Blue Yonder. We put all the ingredients in a cocktail shaker 1/2 filled with ice. We shook it hard until the shaker was frosting. We strained the cocktail into a chilled martini glass and served. This was delicious. 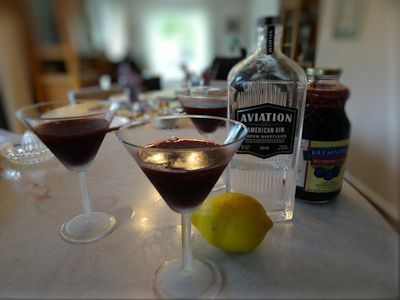 The Aviation gin has a nice crisp taste, blueberry juice didn’t overpower it, the lemon gave it some fresh tart flavour and the bitters gave it complexity. It will be made again! 15 ml (1/2 ounce) simple syrup (2 parts sugar & 1 part water heated until dissolved). Put all ingredients into a cocktail shaker 1/2 filled with ice. Shake hard until the cocktail shaker is frosted. “the things I do for my readers” lol I love it! Yes indeed, making these tasty drinks is poor torture and well worth it! This sounds delicious! I am going to try this during one of my nights of torture. Lol. I love your writing! I am glad you recognized my sacrifice! It is a tasty drink and I hope you enjoy it. I also enjoyed your site and the voice of your postings. I look forward to visiting it often. I’m sure glad we found Aviation gin. It’s my favourite gin as well. Considering we hardly drank gin before, that is quite a change!